Responding to people who almost buy from your online store – only to abandon their purchase at the last moment – isn’t a new concept any more. 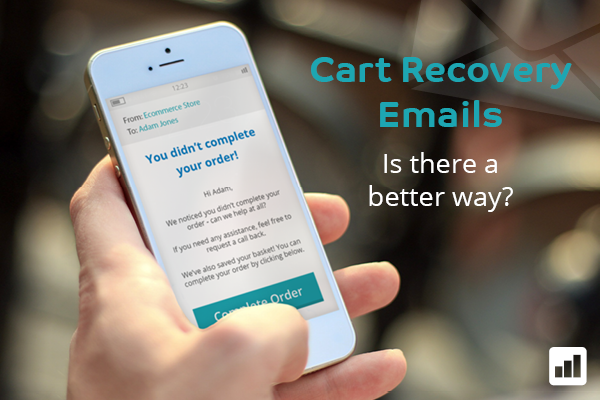 Cart recovery emails are by far the most popular method ecommerce stores use to respond to abandonment, and can be found in the conversion strategies of most businesses who sell online. It’s not difficult to understand why using email for this purpose is so popular – it offers a low-cost, low-maintenance way to try and tackle the 76%*1 of carts which are abandoned before payment. However, with conversion rates unlikely to rise above 5%*2, are cart recovery emails really the best tool for the job? One of the biggest issues marketers face when trying to improve the conversion rates of their email campaigns is getting their message seen in the first place. Around three quarters of emails sent to potential customers will never be opened*2, leaving people who abandon carts to slip away, potentially spending their money elsewhere. An excellent way to tackle this issue is to utilise SMS for your cart recovery strategy. Over 97% of text messages are read within 4 minutes of being received, meaning your message will reach more prospects, more quickly, and allow you a better chance of converting a sale. The more simple, text only nature of SMS remarketing also means your message will be more focused, less cluttered and more likely to make an impression. SMS is also a more personal way of getting in touch, allowing you to put your friendly message alongside the recipient’s other conversations, rather than sitting as one of thousands of marketing messages in an email inbox. However, if it’s a personal approach you are looking for – with conversion rates far higher than SMS and email combined – then there is one engagement method you should be considering – the telephone. Engaging via phone with prospects who abandon allows you to make a timely and friendly connection, checking if there were any problems and offering your assistance. With 28% of those who abandon quoting unexpected shipping costs as their reason for leaving, and 23% citing having to create an account*3, it is clear that many who leave your site are ready to buy, but just need easing over the line. In these scenarios, sending an email with a link to return to your website is unlikely to change your visitor’s mind, and does nothing to resolve their issue. On the other hand, making a personal, helpful connection via telephone allows your business the best opportunity to convert these prospects into customers. By connecting within 15 minutes of abandonment, and scripting calls from a customer service point of view, you can realistically expect to see conversion rates of 21%. When it comes to recovering abandoned carts, the most successful businesses will use a strategic combination of the three engagement methods above. Higher value carts could be targeted with an automated call from your team, with an email sent to those who can’t be reached, and lower value carts could receive a text in the first instance, with an email to follow up those who don’t convert. Some of our best clients using this approach have seen conversion rates in excess of 47%. If you’d like to find out how your business could benefit from a multi-channel retargeting approach, please contact us.